We’ve all been there before – scrolling through our instagram feeds, minding our own business (hardly), and coming across those photos that make you immediately want to jump inside the image and be there in the moment. 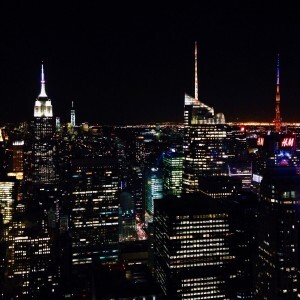 But no city is this more the case than New York – the concrete jungle where dreams are made of. 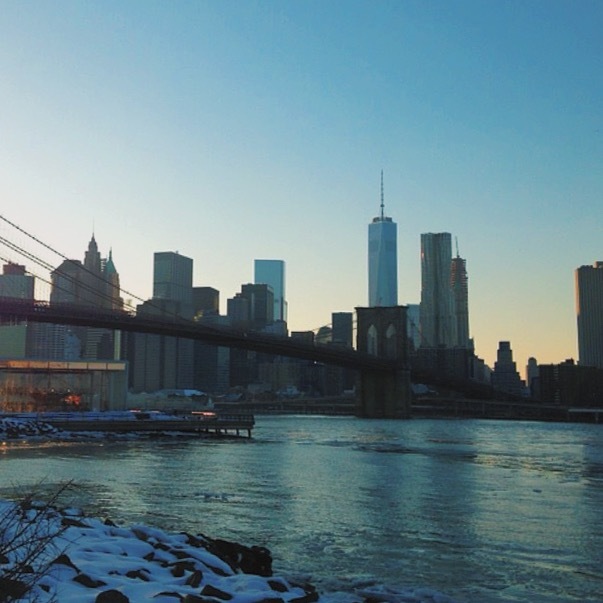 So to help you snap the best shot of The City, here are 5 New York photo spots you must visit. If you’re an avid Gossip Girl fan like me then the view of Manhattan Bridge through buildings, is one you will be familiar with, as it’s often featured when showing the Humphrey Loft in Brooklyn. You’ll locate it by Google Mapping ‘Dumbo’ and the view is quite literally where the red pin will pop-up (Washington and Water Street junction). If you’re not GG fan then not to worry, it’s still a pretty fantastic view! You can even see the Empire State Building through the arches of Manhattan Bridge from certain angles. 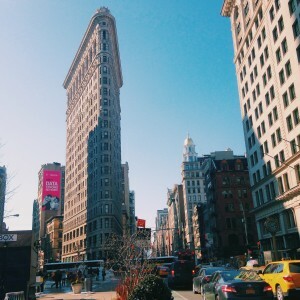 The Flatiron Building was built in 1902, it’s infamous for it’s triangular shape. It is truly spectacular to look at and I think it’s my favourite building in Manhattan. To get a snap of it head to Broadway and E 23rd Street! Also known as Gapstow Bridge. Often pictured covered in snow and looking idyllic in the midst of a Central Park winter wonderland. Again, apologies for the xoxo GG reference, but it’s the spot where Blair likes to feed the ducks. If you want to visit the spot, it’s most easily reached through the E 60th Street Entrance. 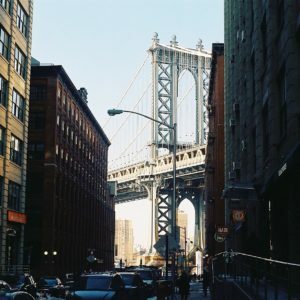 Whilst you can walk over the bridge to take some beautiful photos, head to Main Street Park in Brooklyn, on the banks of the East River to gain a gorgeous view of Lower Manhattan, Brooklyn Bridge and Manhattan Bridge. It’s well worth a visit, if I lived in the city I think this would become my quiet thinking spot. For beautiful lighting and reflections visit here about an hour/half an hour before sunset. This one is a little more obvious, however for a beautiful view of the city head up to the Top of the Rock. You can see everything the city has to offer from here, including the best view of the Empire State Building. 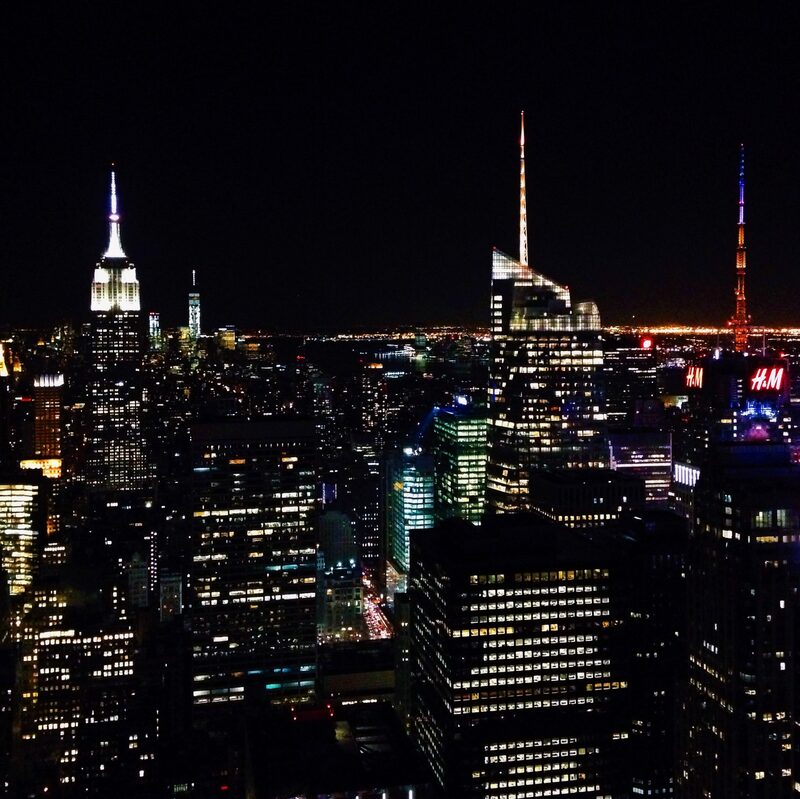 For spectacular views of the city lit up go after dark. For a view across the city visit on a sunny day and if you’d like to watch the city lights turning on head up about half an hour before sun set. Looking back this kinda looks a little like a Gossip Girl photo location post. If you’re after a full list of the best Gossip Girl locations in NYC, you’re in luck! The New York WOW Reader Meetup! All great spots, but I would like to add and highly recommend anyone interested to go across the river to the Jersey City side. Areas such as Exchange Place or Pavonia Newport piers give you amazing views of the Manhattan skyline, especially during sunset! Missing the city dear! I have left so many memory on those places. I wish to be there once again. Talk about fun-filled. New York seems like the perfect city for a weekend visit! Thanks for sharing your experiences! Those are some awesome pictures. I especially loved the Central Park bridge! i love central park. isn’t there filming a home alone and that lady with doves? Great place to visit in New York ! Have you any idea about Places To Visit In Alabama? Totally agree with you. They’re all beautiful architectures. Besides the Flatiron building, I’ve been to the rest. Another must visit place to me is Ground Zero. Thank you so much! I’m going for work and have been trying to plan how much of everything else I can sneak into the same trip! I’ve got the 4 out of 5 shots! The only one I miss is that particular bridge in Central Park. I usually visit Bow Bridge! Washington DC is a city easy to navigate, since a lot of sights are packed along the National Mall. A few of my favorites are the Capitol (outside), The Library of Congress (beautiful interiors), the Botanic Garden, The Lincoln Memorial, Jefferson Memorial and FDR Memorial. For lovely (and Instagram worthy neighborhoods) check out Georgetown and Capitol Hill! I’ve been there twice! It’s a nice place to walk! As anyone been to the high line in new york ? I love NYC and the GG references . I wish i was back there again , i heard that apparently the Flat Iron building is turning into a hotel in the near future. Oh how you make me miss NY! Thanks for sharing. Ok. I have to come back to NY. Ahhh I miss this city! I need a list like this for Washington, DC if anyone can help me narrow that city down! I definitely want to visit the first one! I always see so many cool photos done at this location. Feel like I’m going on a comment spam on all your posts! Will be saving this one for my next trip to New York! Really wonderful photos. For sure NYC offers an amazing array of beautiful sights. We got great photos when we went. Saving this post for dear life. Scavenger hunt for when I go to NY! NYC is amazing. Great views 🙂 I love the Brooklyn bridge one for a relaxing spot while still seeing the city. You are enticing me to go there! 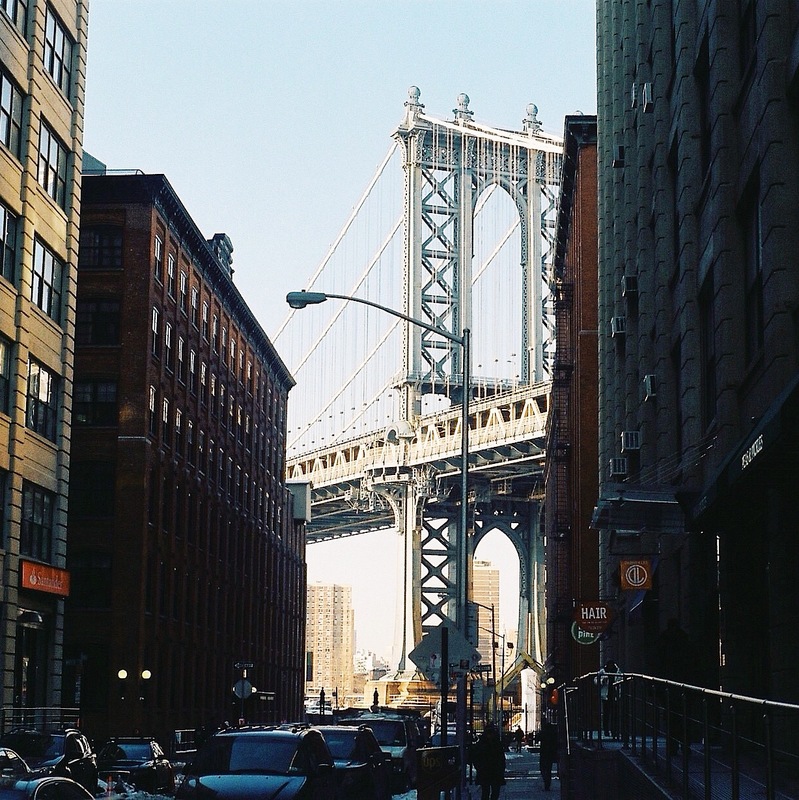 I was in Dumbo the other day and took a picture of the Manhattan Bridge view with my film camera. Your picture is beautiful. I am also a big GG fan! Great picks, makes me want to go back to NYC! Great ideas here! In a city so big and often overwhelming, it’s helpful to know where to go for some iconic shots. And on your travels around to collect these shots, there will be plenty more beautiful sights to see along the way! I’ve been twice in NY, but i have never seen the flat iron building! Indeed, there are so iconic places in NYC that inevitably become the object of photo-desire for anybody having a camera in their hands! Great idea for a post! I am coming this year with Virgin from London! Thanks for the tips. oh I loved New York, and these are all fab suggestions. I have a werid obsession with bridges, I just think they look so majestic. Great shots! I’m visiting NYC for the first time in June so this post couldn’t have come at a better time! absolutely love these suggestions. Can’t wait to see it for myself. It’s one of my dreams to visit New York city! All of these photos are amazing, and this is such a unique and helpful post. Thanks so much for sharing! Walking across the Brookyln Bridge at night is my favorite. There’s something timeless about it that’s difficult to capture in a photograph. Glad you enjoyed NYC as always, Brooke! I hope you’ll visit Washington, DC soon! Yes those should be visit going to New York! I love going to Bryant Park at night to admire the illuminated Empire State Building. I just noticed that I have to come to NYC. The idea famous photos to see in real is great. Sometimes it still shocks me that I have never been to New York City. All of this NYC talk is just perpetuating my love of a city I do not yet know. Thanks for all the inspiration ! I thought the Flatiron was incredible in real life. It’s certainly the most classy building in NY. Reminds me a bit of Europe when I walk by it. I would also add views of the Manhattan skyline from the Brooklyn pier. There are so many interesting things going on there throughout the year, you are bound to get a few great pics. All great picks – I would also suggest the Cloisters if you’re into castles…who isn’t? !